This article shows how to setup Elasticsearch Watcher in Elasticsearch to call an MVC controller in an ASP.NET 5 application. The controller action method will handle these events in part 3 of this blog series. An MVC Controller is used to start and stop the Elasticsearch Watcher events and also handle the events which are received from the watch. The start and stop (delete action method because it deletes the watch) events do nothing more than call the SearchRepository which is responsible for the Elasticsearch logic. The CriticalAlarm action method checks if new critical alarms have been created and does nothing more at present. Now the UI can be implemented for the Elasticsearch watcher start and delete events. This is implemented using HTML and Angular. 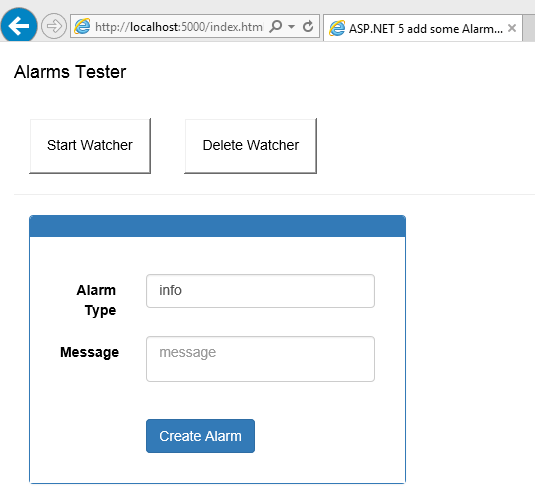 The HTML buttons are implemented in the createAlarms.html file inside the wwwroot/templates folder. The two buttons call the StartWatcher and the DeleteWatcher methods implemented in the corresponding Angular controller, AlarmsController.js. The Angular controller uses the AlarmsService to send the HTTP POST requests to the MVC controller. This is implemented using the Angular $http service. Before the SearchRepository class can be implemented, Watcher needs to be installed on your Elasticsearch instance. If you have a cluster setup, it needs to be installed on each instance. You can download Watcher from here and install as per documentation. 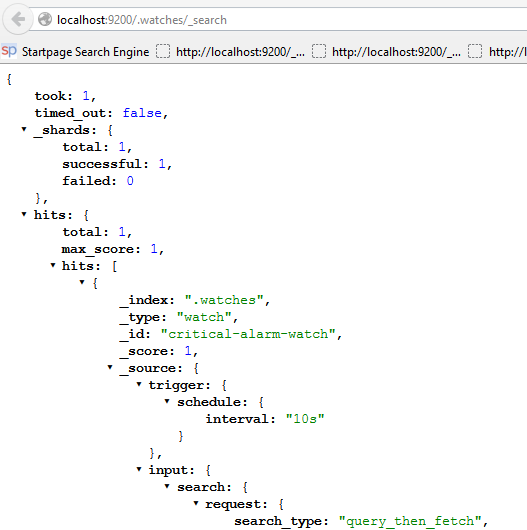 The SearchRepository class creates a new watch inside Elasticsearch and also deletes the watch when required. At present Elasticsearch NEST Watcher does not support the latest version of Elasticsearch Watcher, so for this demo, I have used a basic HttpClient to create and delete the watch. I will replace both these implementations as soon as the new version of NEST Watcher is released. The watch is called critical-alarm-watch. The watch checks every 10 seconds to search for critical alarms. The watcher then sends the total found critical alarms to the MVC application using a webhook and sends the payload total in the body. This of course could be optimized by using a better search and only sent if new alarms have been logged. The HTTP POST is sent using Elasticsearch NEST Watcher. The Delete code is also implemented using the NEST.WATCHER. This just deletes the watch using a HTTP REQUEST DELETE. Now the application can be tested. Start the application and click the Start Watcher button. This creates a new watch. This can be viewed using the _watcher/stats GET request. You should have at least one watch now. If a break point is set on the CriticalAlarm action method inside the WatchEventsController, you will see the Watcher event, with the actual number of critical alarms. Now create a critical alarm. This adds a critical alarm document to Elasticsearch. The amount of critical alarms received in the watch event has increased. 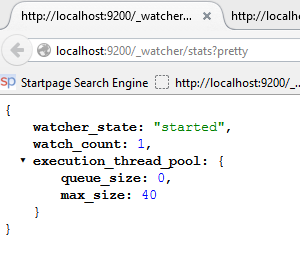 The Watcher is up and running with MVC 6. 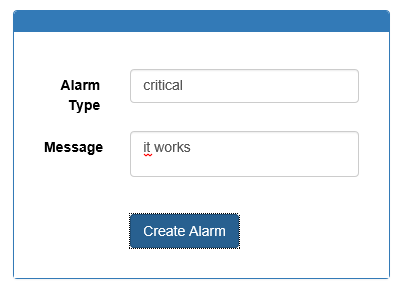 Next step is to display the alarm events in the UI. This will be done in part 3 of the series. I only have a trail license. You need to give an email address and Elastic will supply a license in an email. Watcher is part of the subscriptions. I don’t know if open source projects, products can use this for free. About it ElasticSearch, any step-by-step guide, or Getting Started – Quick Start that can be completed in 15-20 minutes? Any good getting started with ElasticSearch? step by step in 10 minutes?